I believe it is better to refer to believers as “Christ-followers” than it is to refer to them as Christians. To be a Christian is to be labeled as a believer, but this word is so generic today almost anyone can claim to be a Christian, but to be a Christ-follower is much different because we do more than claim to be a Christian, we claim to follow Christ wherever He leads, and He may lead us into some very difficult places and circumstances. Jesus never came up to anyone and said, “Let me into your heart,” or “accept Me,” but rather He wants us to show our love for Him as He says, “Follow Me” (Matt 4:19) and them follow Him. There are not scriptural references where Jesus or any of the other apostles said, “Accept Jesus,” “Let Him into your heart,” or “Pray this (sinners) prayer.” No one is ever saved by walking down the aisle and coming forward, or filling out a “decision card” or repeating a prayer that someone else leads them in, but rather, a person is saved when God grants them repentance and they put their trust in Christ. We don’t put our trust in a decision card, or going to the altar, or in “accepting Jesus.” Salvation is fully a work of God and so God, rightly so, receives 100% of the glory. That’s how a person is born again or born from above (John 3:3-7). It is an act of God that is part of the will of God. There are dozens of times that Jesus comes up to those He has called and tells them, “Follow Me.” One such example is when He was choosing His disciples and “While walking by the Sea of Galilee, he saw two brothers, Simon (who is called Peter) and Andrew his brother, casting a net into the sea, for they were fishermen. 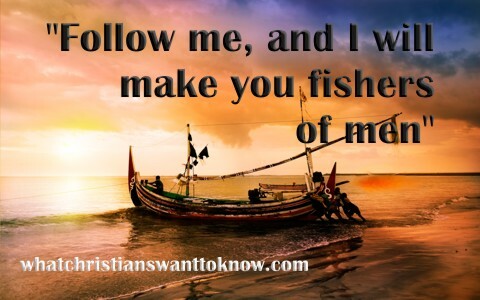 And he said to them, ‘Follow me, and I will make you fishers of men.’ Immediately they left their nets and followed him.” (Matt 4:18-20). There is no hint of these men stopping to count the cost or talking it over with one another, it simply says, “Immediately they left their nets and followed Him” (Matt 4:20). They left their job security, the only living they had known, to go with Jesus and follow Him and really had no idea about what they were getting into. Later in the Gospel of Matthew, “Jesus passed on from there, he saw a man called Matthew sitting at the tax booth, and he said to him, ‘Follow me.’ And he rose and followed him” (Matt 9:9). Again, there is no indication that Matthew had to stop and think about what he was doing. Being a tax collector for the Roman’s was a very lucrative position to have but Matthew didn’t think about all he was going to lose or leave behind. It only says, “And he rose and followed him” (Matt 9:9b). That is what it means to follow Christ. It is a radical change of lifestyle where we seek the kingdom above all things (Matt 6:33) and it will be painful and cost us, but as Jesus told the Apostle Peter who had just said he had forsaken all, “Truly, I say to you, in the new world, when the Son of Man will sit on his glorious throne, you who have followed me will also sit on twelve thrones, judging the twelve tribes of Israel” (Matt 10:28). Those who follow Christ were told by Christ to count the cost before they followed Him. Jesus said, “which of you, desiring to build a tower, does not first sit down and count the cost, whether he has enough to complete it” (Luke 14:28)? Further, He says that “everyone who has left houses or brothers or sisters or father or mother or children or lands, for my name’s sake, will receive a hundredfold and will inherit eternal life” (Matt 19:29). This type of love for Christ is so intense that it appears to look like hate toward our own family members. Even so, hear what Jesus will say to those who have done for the least of these, His people, “Come, you who are blessed by my Father, inherit the kingdom prepared for you from the foundation of the world” (Matt 25:34). Notice that this inheritance is not for this world or anything in this world, but for the world to come. God has prepared a kingdom for us and He plans to use us for His glory in the coming kingdom. That is, if we have counted the cost and forsaken all others to follow Him. It’s not easy; it’s painful and expensive, but the inheritance to come is beyond comprehension. Jesus said that “If anyone comes to me and does not hate his own father and mother and wife and children and brothers and sisters, yes, and even his own life, he cannot be my disciple” (Luke 14:26), but as I mentioned earlier, we’re told to love others but the love we display for Christ is so much greater that if you compare the love we have for Jesus and the love we have for family, it would almost look like hate. Jesus is not telling us to hate our family but to love Him as if it looks that way. That’s because “Whoever loves father or mother more than me is not worthy of me, and whoever loves son or daughter more than me is not worthy of me” (Matt 10:37), so “Whoever loves his life loses it, and whoever hates his life in this world will keep it for eternal life” (John 12:25), but if we love our lives more than Christ, He warns us that we “cannot be [His] disciple” (Luke 14:26b). We must count the cost of following Christ and this means we must die to ourselves and our own interests and live for Christ. Jesus tells everyone who desires to be saved that “whoever does not take his cross and follow me is not worthy of me” (Matt 10:38) and even more specifically, “If anyone would come after me, let him deny himself and take up his cross and follow me” (Matt 16:24). One final warning that is very sobering comes from Jesus’ own lips as He said about the Day of Judgment, “On that day many will say to me, ‘Lord, Lord, did we not prophesy in your name, and cast out demons in your name, and do many mighty works in your name?’ And then will I declare to them, ‘I never knew you; depart from me, you workers of lawlessness” (Matt 7:22-23). Did you catch that? “Many” will come to Him thinking they are saved but they loved their lives and lost it, they didn’t count the cost but followed their own desires, and so they were not worthy of Him. Jesus doesn’t say, “I didn’t know you well enough,” or “I wished I had known you better,” but instead, He says, “I never knew you.” If Jesus doesn’t know you, it doesn’t matter what you do for Him; but if you follow Him wherever He leads you and die to yourself and not love anyone or anything more than Him (including your own family), then Jesus says they are “not worthy of me” (Matt 10:38b). This may also interest you: Do You Know Your Role in the Kingdom of God? Hi PJ! Sobering message. Indeed we are to examine ourselves to see if we be in the faith(2 Cor 13:5). I think some out there might be doubting their salvation right now. Salvation is dependent on God’s Holy Spirit. Without Him drawing us to Himself there is no salvation. He saves those whom He will. We respond with belief and trust in Jesus…that is, we believe in His life , death and Resurrection trusting that with His death our sins are buried with Him and with His Resurrection we are promised(guaranteed) everlasting Life with Him. We are indeed called to love Him more than anything and to daily take up our cross and follow Him. I know you agree with me in that if we fail in “doing” these things we are not going to lose our salvation. We need to repent of our failings, pick ourselves up with God’s Grace and continue following. It is only through His Grace and forgiveness and mercy which is continually bathing His followers that we journey onward and upwards to our final home, right? As always Doc, a good word from you. Amen…I prefer to call Christians “Christ-followers” because everyone seems to claim to be a Christian but so few actually follow Chirst. I know you do bro. May God bless you. Great to hear from you. I used to call myself a Christian, but didn’t always behave as such, until one day I felt the Holy Spirit stirring so strongly in me to repent my old ways and start acting how Jesus would want me to act. That changed my life, and all of a sudden, my cup was full, and I no longer felt something was missing in my life. Praise Jesus! Yes! Jesus says to follow Him so many times. American churches need to get back to this. Thank you for standing up for this key part of the gospel. God bless you for dedicating your time to bring light to many. Praise be to the most High. Lets preach the true gospel and pray God to enable us reach as many people as we could.